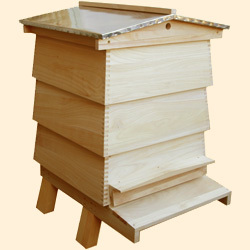 There are many different regional bee hive designs with even more variations. As with every aspect of keeping bees, to say there is more than one way of doing things is an understatement so the choice is mainly a matter of personal taste. The British National standard bee hive is the most commonly used bee hive in the U.K. by both hobby and professional beekeepers. It is designed to be the easiest to use in practice with many books written about its use. It also has the widest variety of equipment available making it the most versatile. 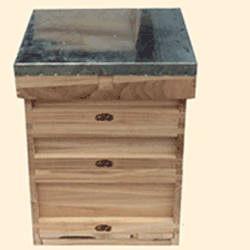 The National standard bee hive is the most widely recommended bee hive for a beginner. The W.B.C. Bee Hive is the original, iconic British beehive design dating as far back as the 19th century. It has a double wall design with an outer case and inner boxes which is considered less easy to use and less practical for some. The boxes are different to a National standard bee hive but it uses the same National bee hive frames. The Cornish Top Bar Hive and the Warré Bee Hive are alternative methods of keeping bees without frames or foundation. It is a primitive method of management though by its nature it is considered less easy to use and less practical for some. NOTE: You may be starting out with one bee hive and one colony of bees but be prepared to eventually keep at least two in an apiary. There are good reasons for keeping a minimum of two colonies. It is not uncommon for colonies to fail during winter so if you only have one colony you will have to find a replacement in the following year if you want to remain a beekeeper. It would be very bad luck to lose all colonies in winter so surviving colonies can be "split" in the following year to make up the loss. Many problems in one colony can be solved if access to a second colony is available. Much more will be learned by having at least two colonies to compare. 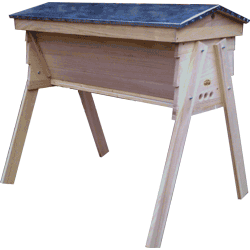 NOTE: Both the National beehive and the WBC bee hive are available with options for different depth brood boxes - the Standard Deep brood box and the Extra Deep (also known as a "14x12" or "Jumbo" brood box). We advise beginners to start with the Standard Deep brood box - it is the industry standard size being the most practical and versatile. It can also be adapted to make an Extra Deep brood box if needed or desired so keeping the option open (an Extra Deep brood box cannot be made smaller). Therefore our advice is to start with a National bee hive as a first bee hive then have a W.B.C. bee hive as a second hive if that is what you fancy, the frames are interchangeable, or a top bar hive which requires no frames anyway.